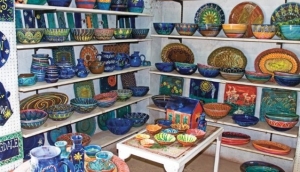 Barbadian artisans continue to make strides at home and abroad. Their pieces captivate and inspire, and with varied styles, media and expressions many readily reflect different aspects of Barbadian culture and heritage. Some treasures are sought, while others are chanced upon, so take a moment to visit our artisans at their studios. They will love the opportunity to show you their work, much of it created from available natural resources and using fine-honed skills passed down through the generations, so you know Barbados craft is always unique and well-made.